JOPLIN, Janis. ALS to Peter J. De Blanc. Port Arthur, Texas , 1965. 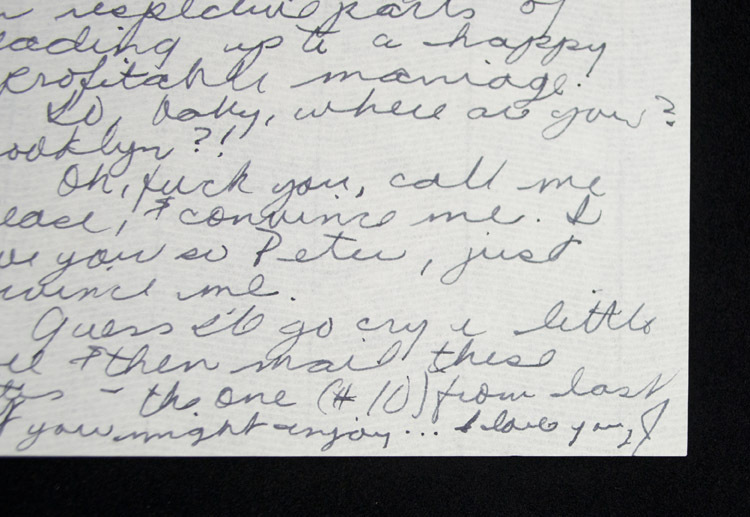 Letter #11 of a series of letter written by Janis Joplin to her then fiance Peter J. De Blanc. 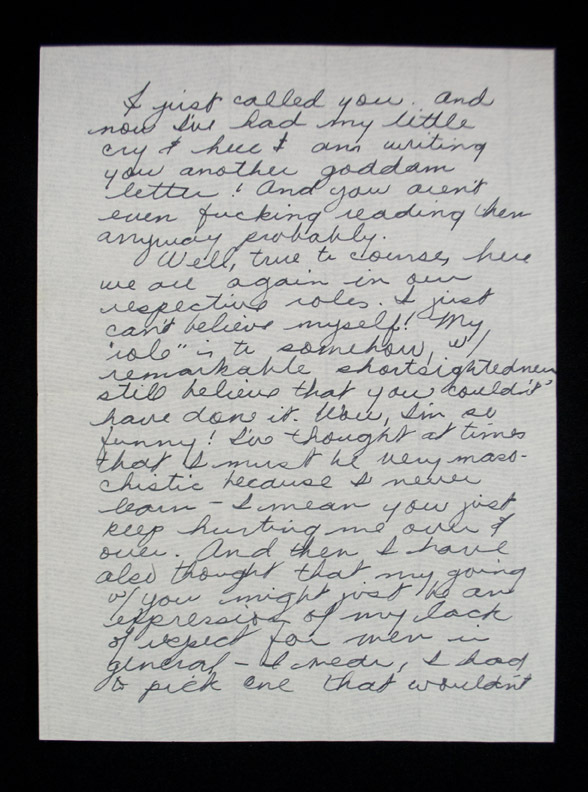 Letter signed "J". Two quarto pages (7 3/4 x 5 3/4 inches; 199 x 147 mm). Black ink, written on recto only of each sheet. With addressed envelope. 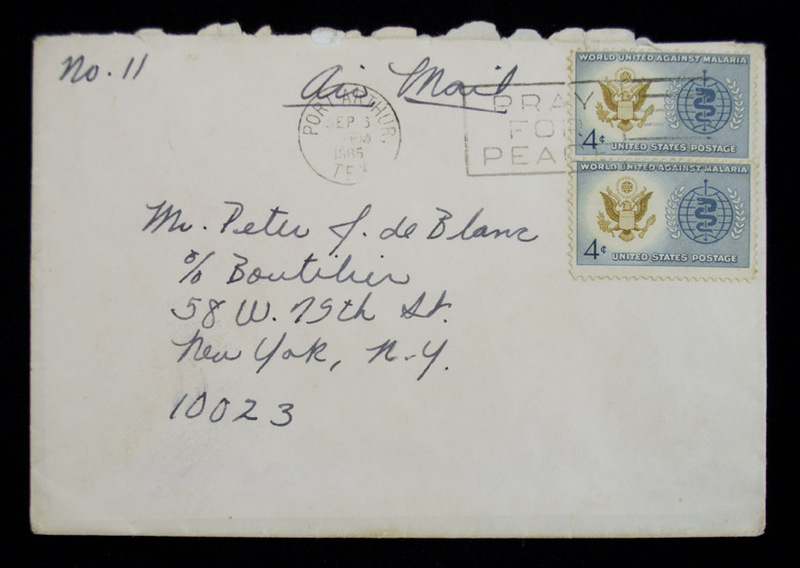 Place, date and letter number from envelope. A very good example. "I just called you . And now I've had my little cry & now? I am writing you another g-ddam letter! And you aren't even f-cking reading them anyway probably. Well, true to course, here we are again in our respective roles. I just can't believe myself! My "role" is to somehow, w/ remarkable shortsightedness still believe that you couldn't have done it. Wow, I'm so funny! I've thought at times that I must be very masochistic because I never learn- I mean you just keep hurting me over & over. And then I have also thought that my going w/ you might just be an expression of my lack of respect for men in general- I mean, I had to pick one that wouldn't make it. But this is probably all just typical Janis-over-introspection. Jesus God, Peter, I don't know! I just want to make one point in continuing this sham if that is all this is. That, unless this is all you are doing, it isn't going to work anyway. We aren't ever going to be able to be married & be happy if we aren't doing, right now, our respective parts of leading up to a happy & profitable marriage. So baby, where are you? Brooklyn?! Oh, f-ck you, call me please, & convince me. I love you so Peter, just convince me. 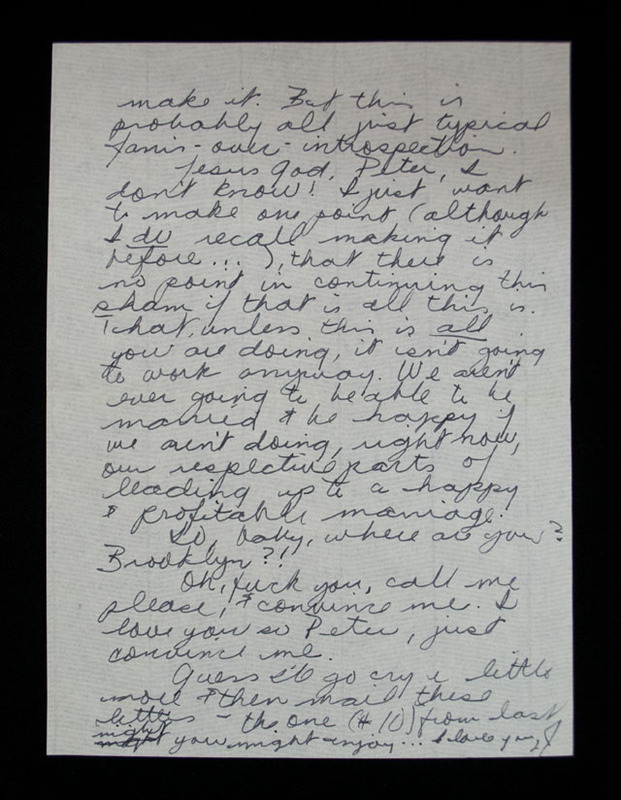 Guess I'll go cry a little more & then mail these letters- the one (#10) from last nigh you might enjoy...I love you, J"
"[In 1963] Janis moves to San Francisco, CA, and begins recording music. Her romantic partners include a woman, Jae Whittaker, and more significantly, Peter de Blanc, with whom she was engaged. By 1965 Janis is worn out from drug use, withered to 88 pounds, and de Blanc and her friends raise money to send her home to Port Arthur, TX. She lives with her parents and gets sober, and plans a new life for herself. She enrolls at Lamar University in Beaumont and performs regularly in Austin. By the end of 1965, Janis and de Blanc are no longer engaged." (PBS American Masters). 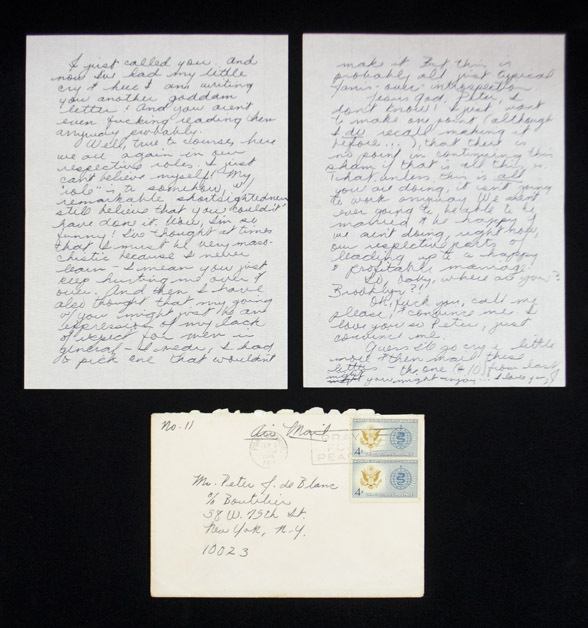 During this period of time in 1965 while Joplin is living in Texas and de Blanc is living in New York working for IMB, she wrote a series of letters to him which she numbered on the envelopes. This present letter is number 11. It would be a few years later before Joplin found fame and success in her music career and only five years before her untimely death.